This is a neat, inexpensive gift in a jar recipe and you may already have all the ingredients. 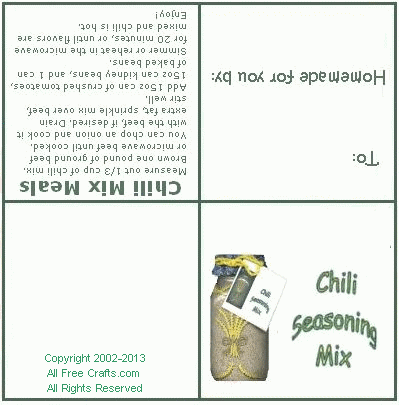 We’ve included a free printable tag to attach instructions for making the chili. Chili is one of those rib-warming homemade meals that goes great with a salad and fresh bread. This mix is easy to assemble and suitable for almost anyone. This particular recipe is a medium spiced chili seasoning that will make six meals. If you like mild chili, cut the chili powder down; if you like spicy, increase it or add crushed hot pepper flakes to taste. Mix all ingredients, stirring very well to combine. 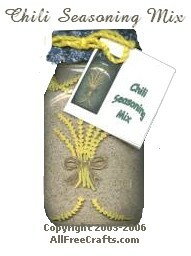 Pack in a 2 cup jar and attach gift tag which includes instructions. To use the free printable gift tag, print it and cut it out, then fold in half and in half again, so that the picture is on the front and the recipe directions are inside. Fill in the name of the gift recipient and your own name. Punch a hole in the top left corner of the tag to tie it to the jar. Brown or microwave 1 pound of ground beef (Optional: you can chop and add an onion if you wish). Sprinkle 1/3 cup of chili seasoning mix over beef, and stir well. Add a 15 oz can of crushed tomatoes; a 15 oz can undrained kidney beans; a 14 oz can of baked beans. Simmer or reheat in the microwave for 20 minutes until flavors are mixed and chili is hot. Enjoy! How much would you sell these jars for if you were not giving them as a gift? That is such a hard question to answer. Much would depend on what you paid for the ingredients, how many jars you made, the jar presentation, and lots of other considerations such as where you would sell them (at a school fundraiser..or a high-end grocery boutique). As a rule of thumb, I think that I would double my costs, plus a little more.